The impacts of tax reform on U.S. businesses big and small is helping to jumpstart job growth, increase wages and result in other positive impacts to local communities. 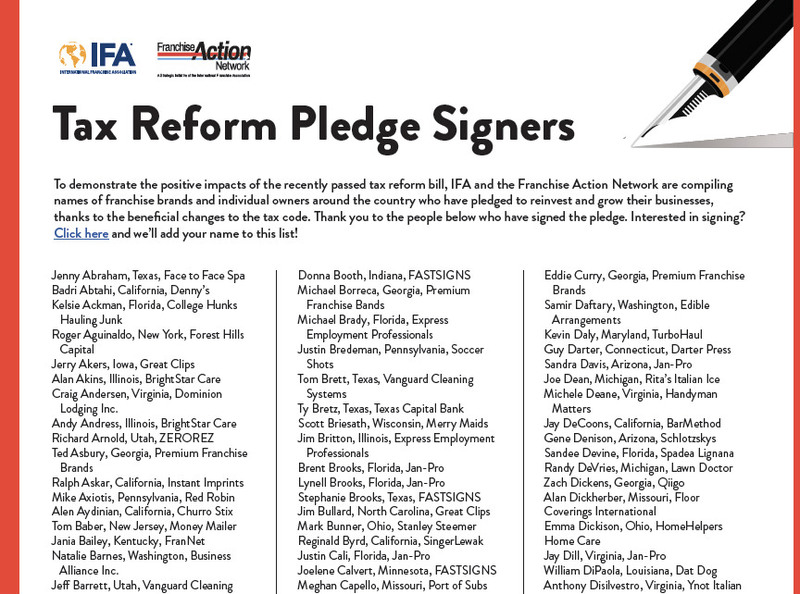 Click here to add your company to the list of IFA members who have pledged to reinvest. Steve Zishka, an Indiana-based franchisee with BrightStar Care, decided to reinvest the tax savings back into the business in the form of increased pay for employees and business expansion plans. “We signed a deal with BrightStar Franchising to build an assisted living facility in Fort Wayne,” he explained. The facility will result in around 20 new jobs in northeastern Indiana. “We also feel that the tax savings will allow us to provide raises to all employees in 2018,” he continued, the first time in three years involving across-the-board raises to the company’s 250 employees. “These raises are critical for us to continue as the higher standard home healthcare provider in the area,” Zishka said, translating into higher employee retention and recruiting. Alan George, Vice President of IFA supplier member Franchise Marketing Systems, said the company is opening a new office and hiring two new employees as a result of lower taxes. Dustin Hansen, CFE, InXpress Americas CEO, reports that the U.S. branch of the company plans to increase staff by 23 percent in early 2018, for both management and entry-level positions. “InXpress USA has also added additional investment dollars into employee development/training, signing an agreement with vendor FranklinCovey to cover a variety of subjects based on employee development plans,” he said. 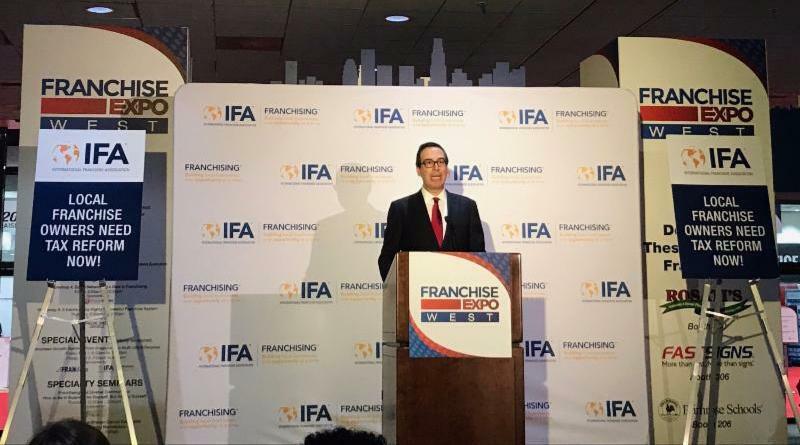 U.S. Treasury Secretary Stephen Mnuchin gave the keynote at Franchise Expo West in 2017 as part of the push for the tax bill. Michael Borreca is Chief Financial Officer at Premium Franchise Brands, franchisor of the Jan-Pro and Maid Right brands. The impact from lower taxes will result in the ability to invest in more personnel, noting that the company previously only planned to hire two or three new employees and has increased the number to five or six. Existing staff will also see a salary increase. Trace Thompson, a Jan-Pro franchisee in Tampa, Fla., plans to offer more money through the franchise’s scholarship funds and add more vehicles to the fleet. Thompson also wants to allocate additional funding to research and development, along with hiring. Texas-based Sun Holdings President and CEO Guillermo Perales said that the money saved in taxes will result in new stores and more jobs being created. Sun Holdings is a multi-unit franchisee of Burger King, Popeyes Louisiana Kitchen, Krispy Kreme, Arby’s, Golden Corral, Cici’s Pizza and T-Mobile. Perales is the recipient of the 2015 IFA Entrepreneur of the Year award.